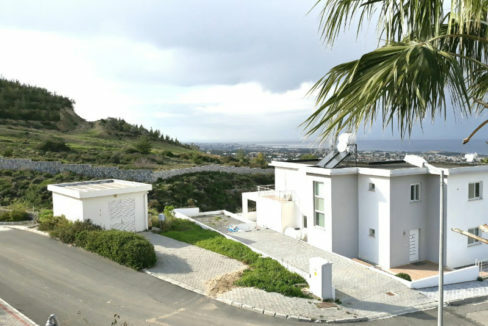 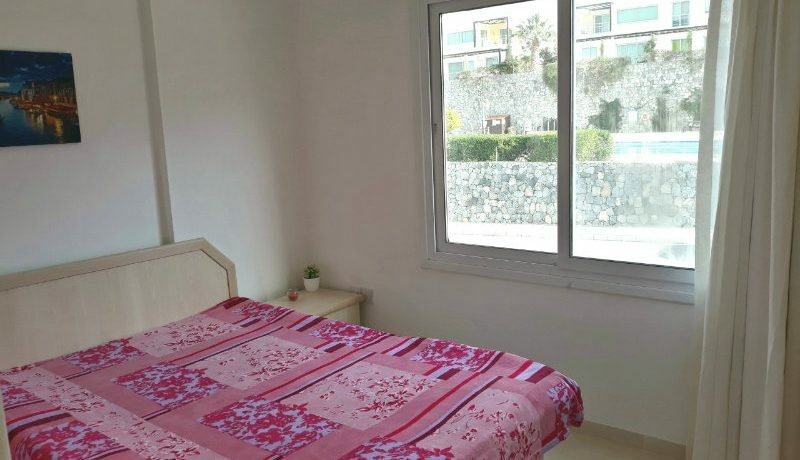 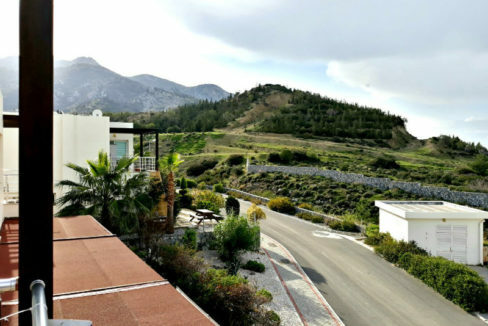 Catalkoy – elevated mountainside penthouse with title deeds and breath-taking panoramic coastal views of Kyrenia coastline. 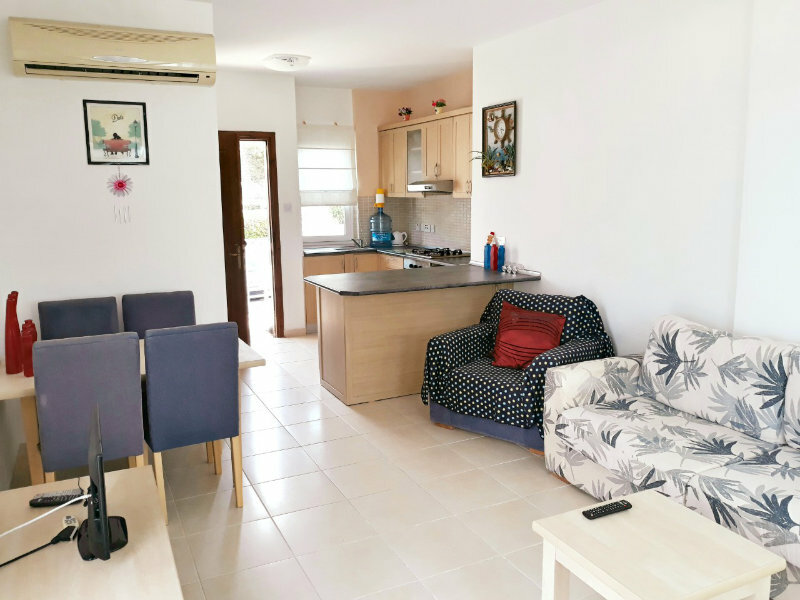 A short drive up the hill from popular Catalkoy village, in a cul de sac location, is this tranquil apartment cluster with lovely shared pool and landscaped gardens with palm trees which is truly a little piece of heaven. 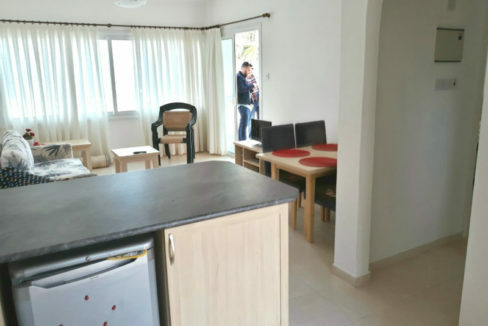 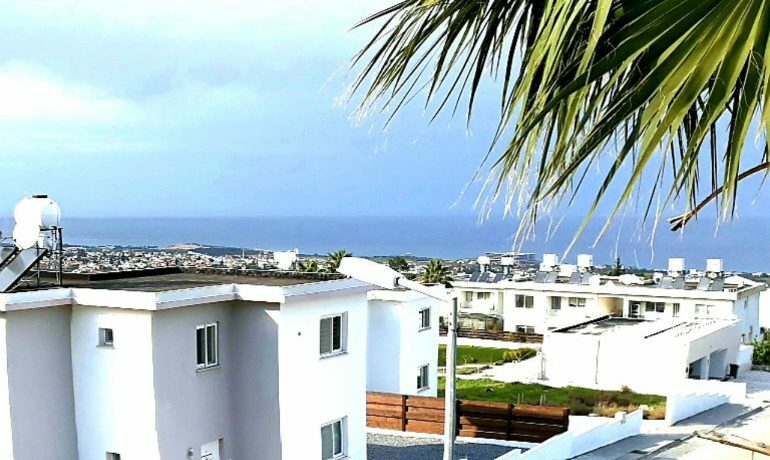 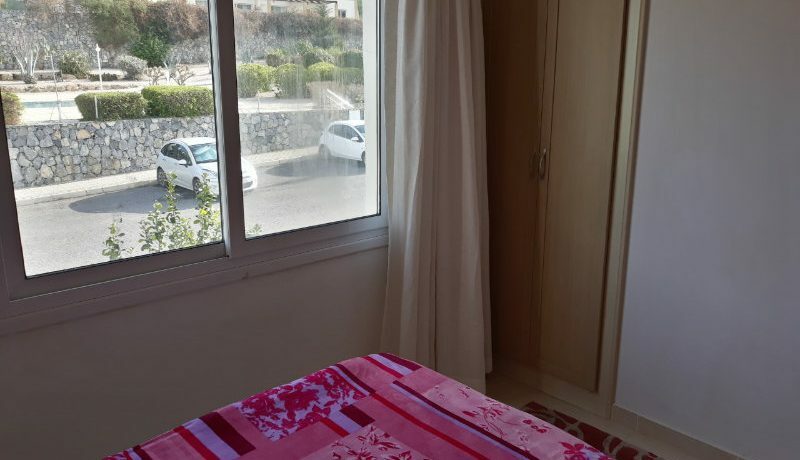 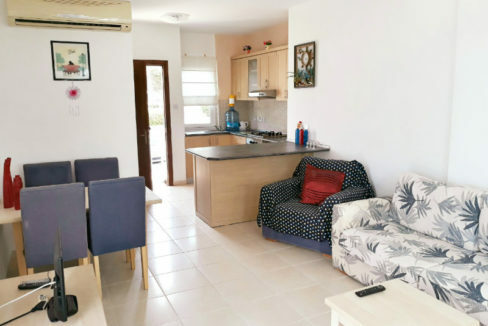 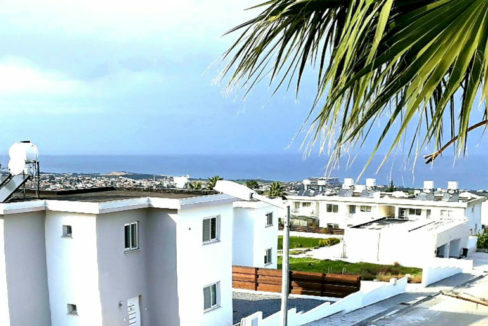 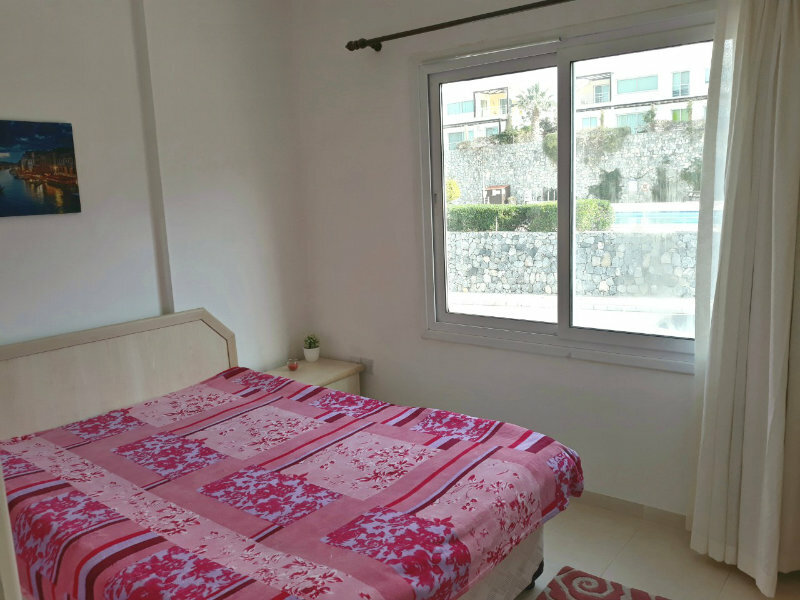 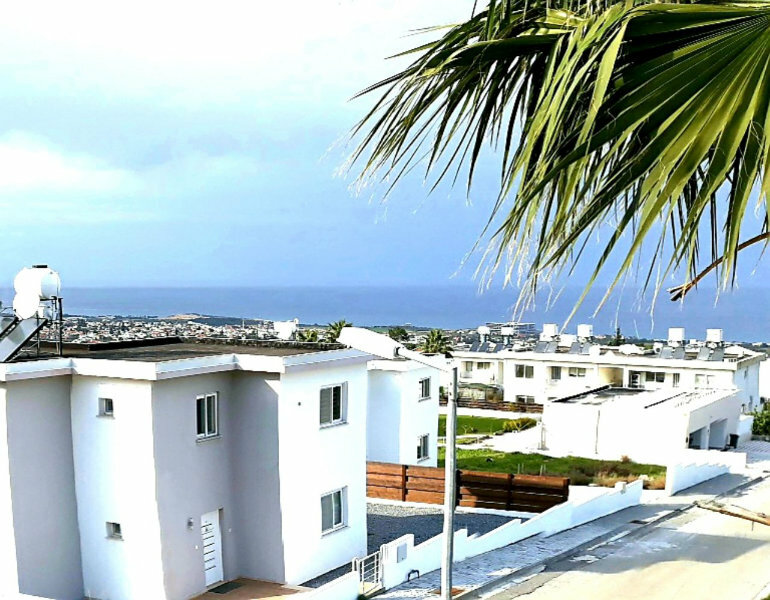 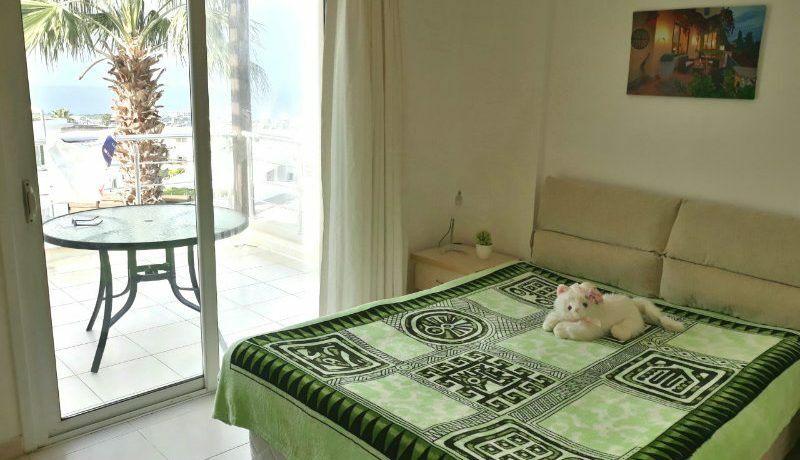 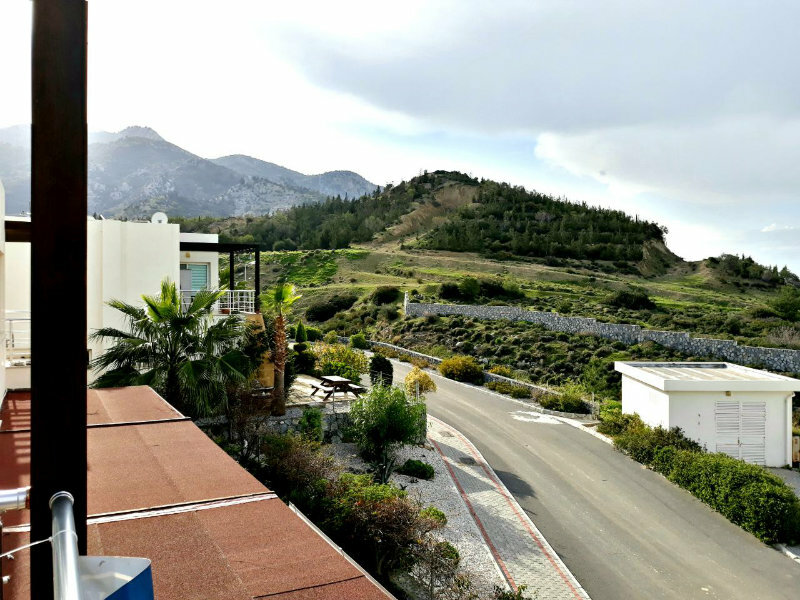 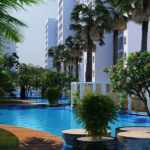 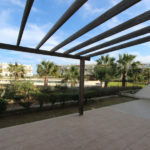 Perfect for both full or part-time residence or holiday property, this spacious 80m2 penthouse comes fully furnished with all white goods and air conditioning units. 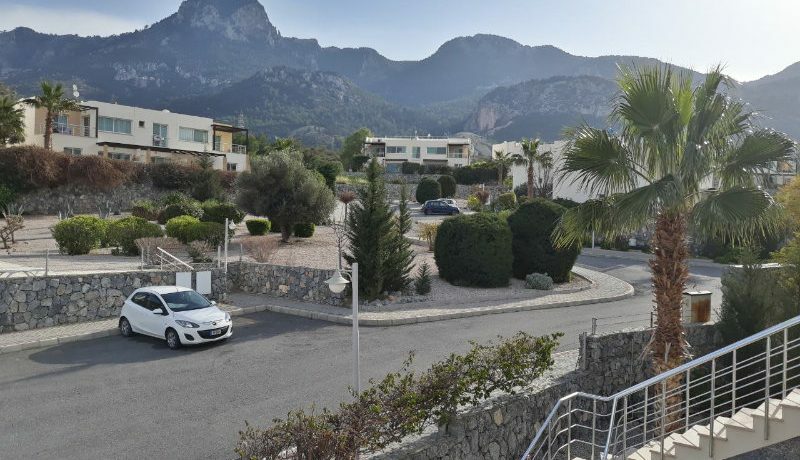 Car parking is on a quiet road. 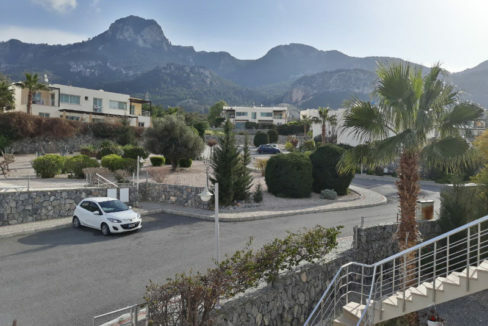 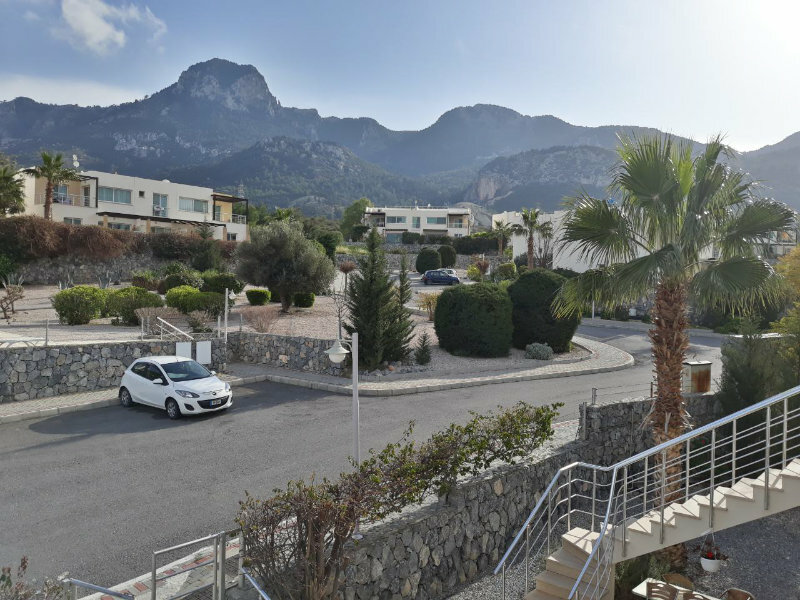 Enter the apartment block via a gate and then up stone steps to the front door with a small entrance balcony overlooking the pool and mountain views to the southwest. 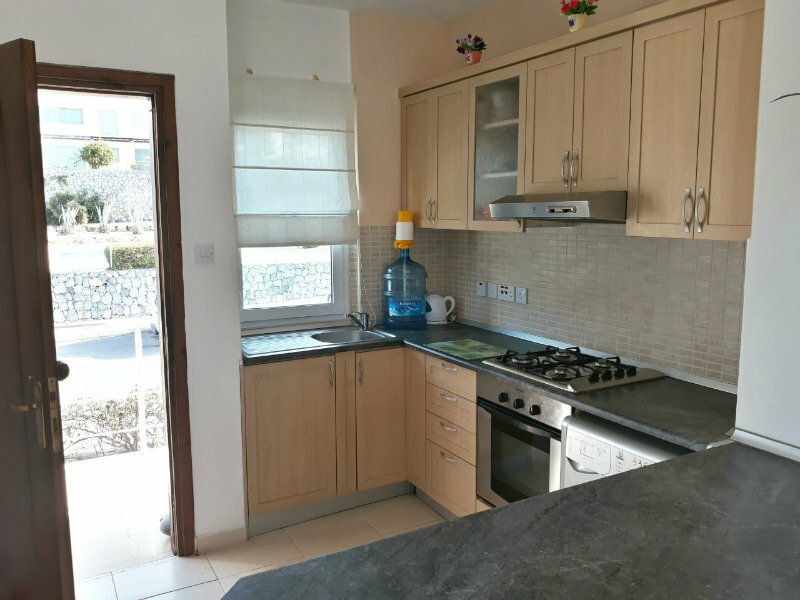 The front door opens into the spacious kitchen, dining and sitting room area with small fitted kitchen to the left with sink under a sunny window with pull down blind facing the pool area. 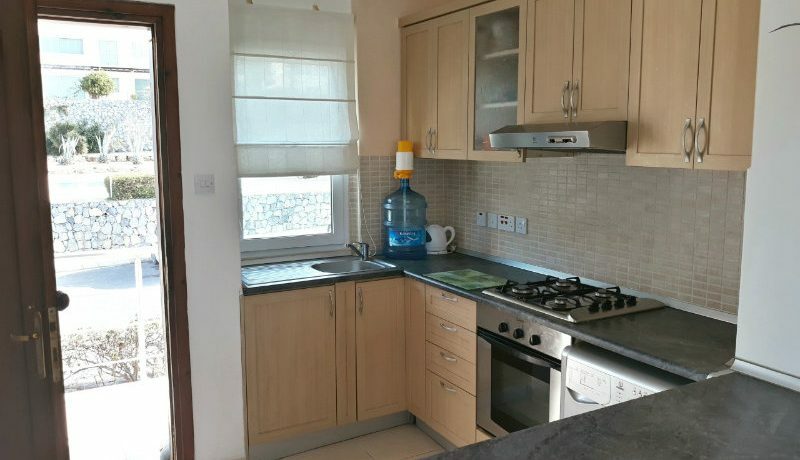 The fitted kitchen comes with a range of under counter and wall mounted wood effect units plus silver goods including dishwasher, washing machine, electric oven, gas hob, extractor fan and fridge freezer. 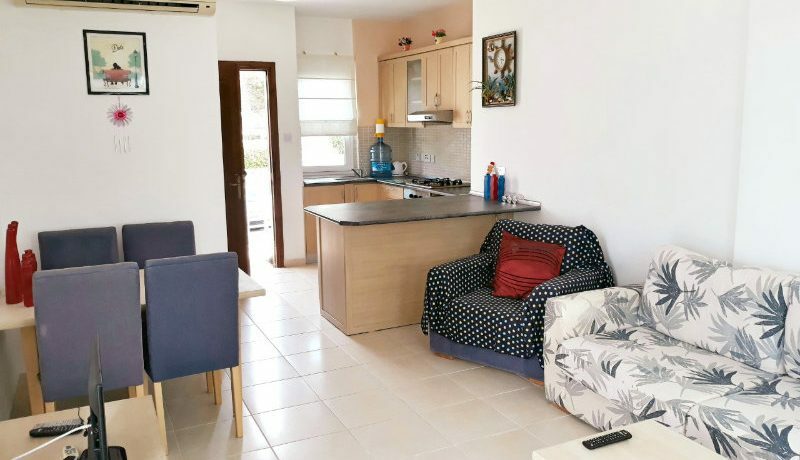 There is an L shaped unit come breakfast bar with fridge beneath dividing the kitchen area from the sitting area, plus dining table and chairs offering additional seating option. 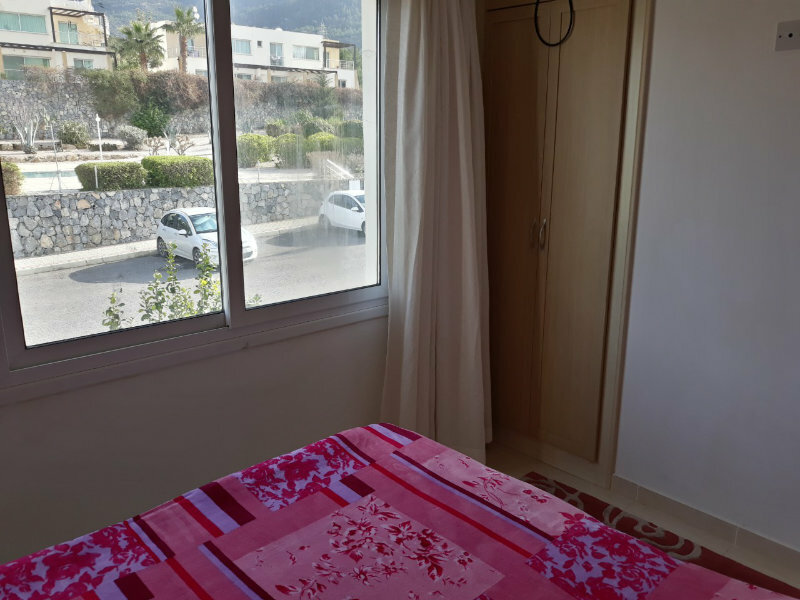 Beyond is the sitting area with sofa, armchair, TV unit and picture window facing northeast to Kyrenia and sliding French window to the outside 20m2 sea view balcony with its panoramic views and ample space for outside dining. 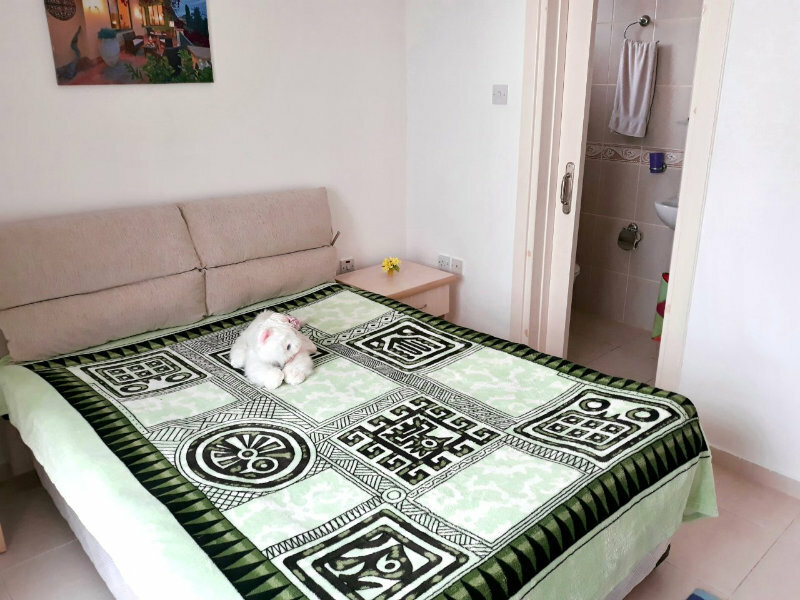 Opposite the kitchen area is a small corridor leading to the two double bedrooms, both currently furnished with double beds and bedside units. 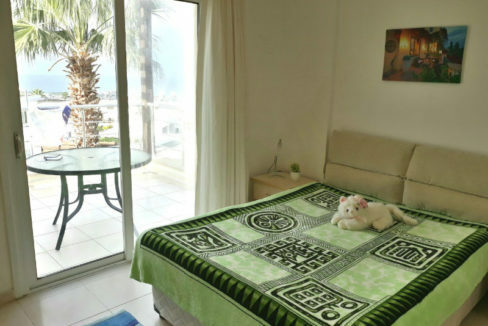 The master bedroom has stunning sea views, fitted wardrobes, ensuite shower room and a sliding window to the 20m2 balcony. 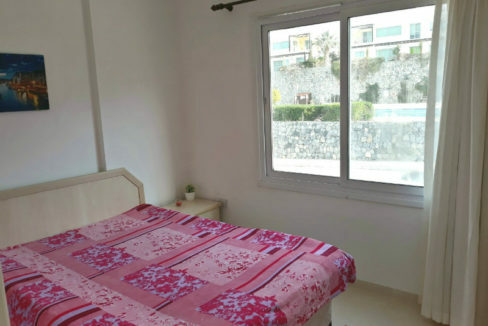 The pool-view bedroom also has fitted wardrobes. 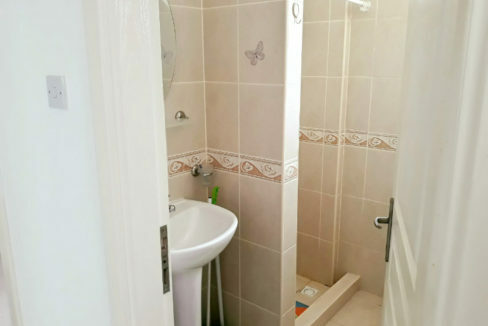 There is a second family shower room. 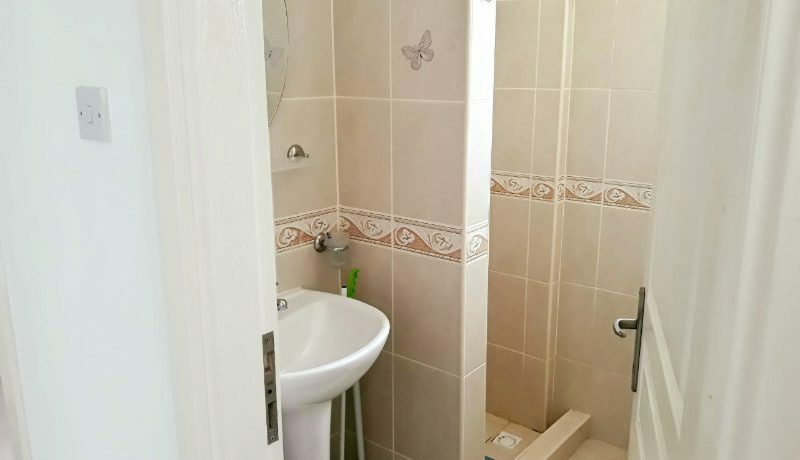 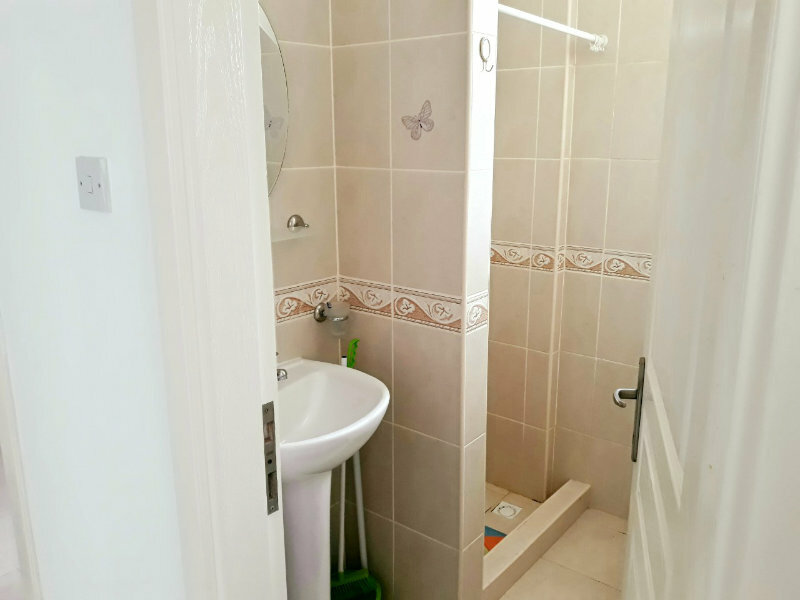 Both bathrooms have floor to ceiling tiles and the floor is tiled throughout the apartment. 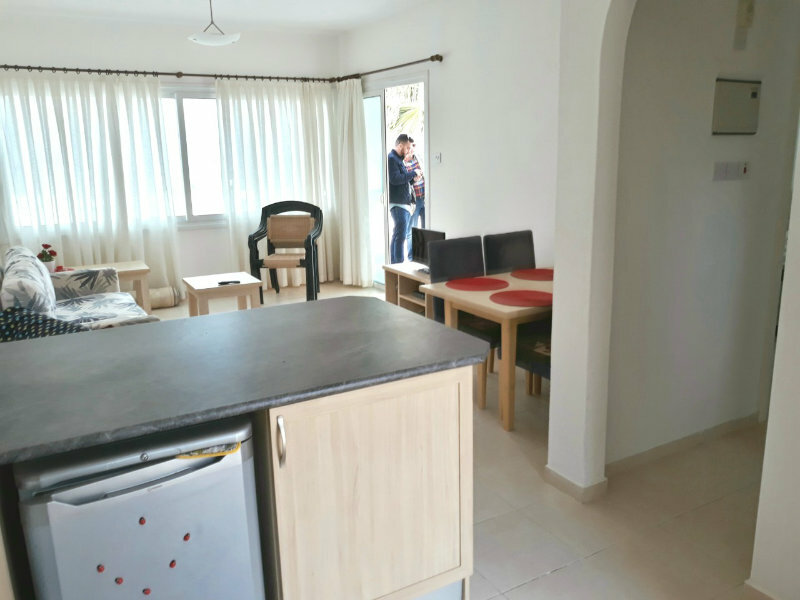 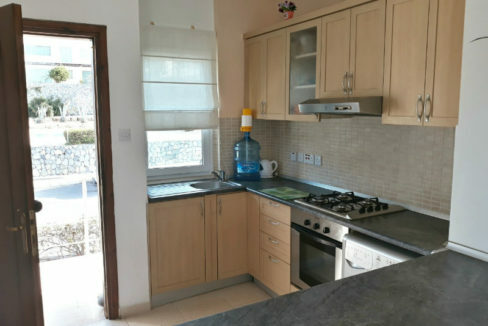 At this very reasonable price, this property represents excellent value for money, with huge holiday letting potential in the spring, summer and autumn seasons. 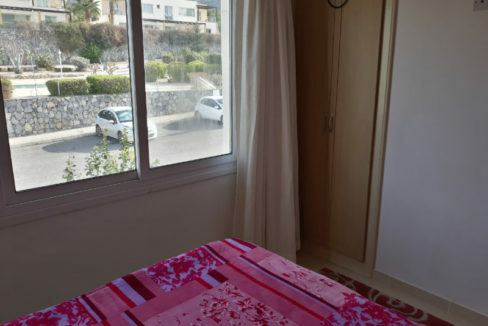 A car is necessary for this location. 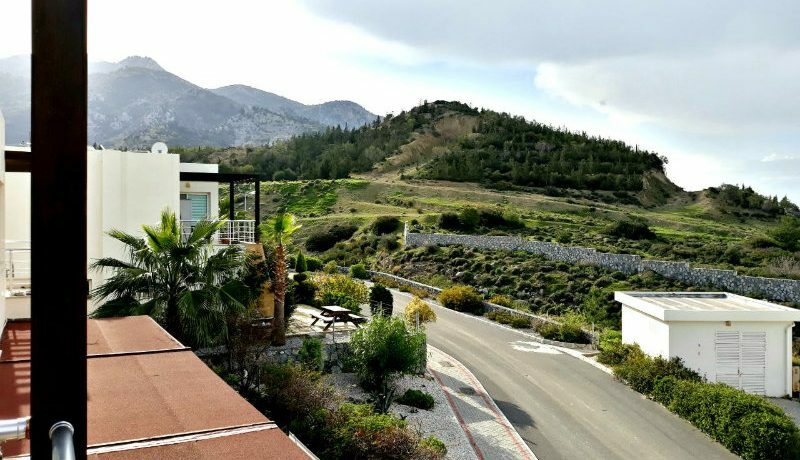 A short drive down the hill, sought-after Catalkoy village has the full range of local small shops and charming restaurants and cafes, and below the village find the main road with its ample stock of supermarkets and wide-ranging shop selection. 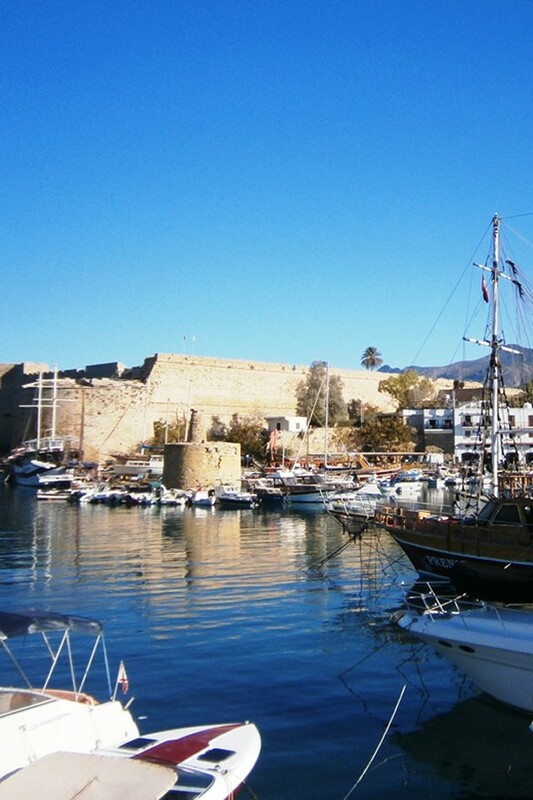 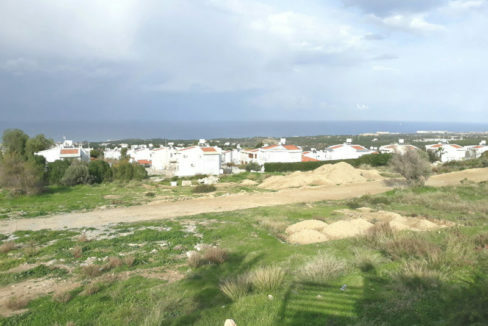 The outskirts of Kyrenia are only 10 minutes away with beaches just a short drive to the east. 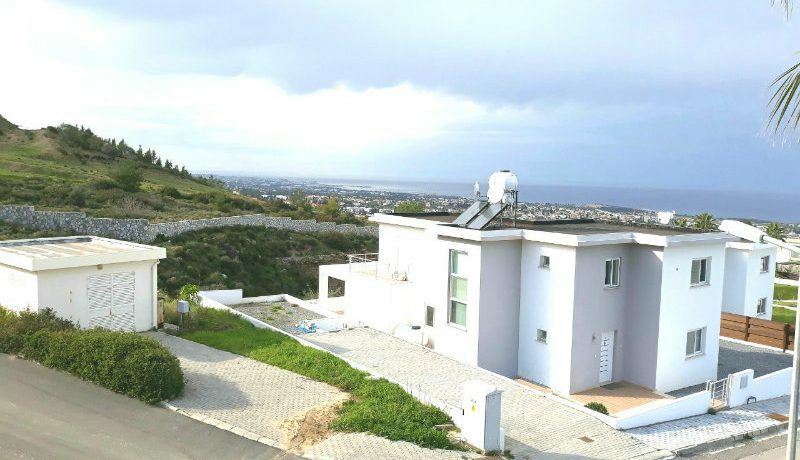 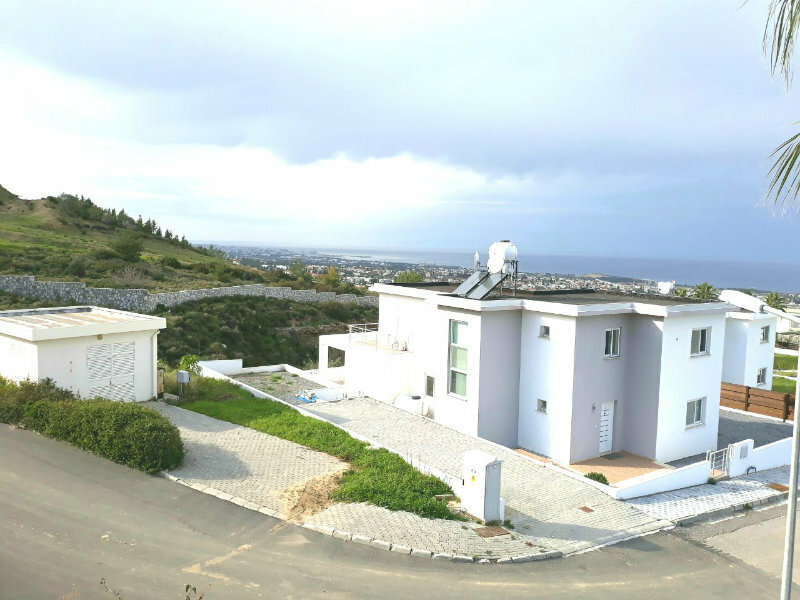 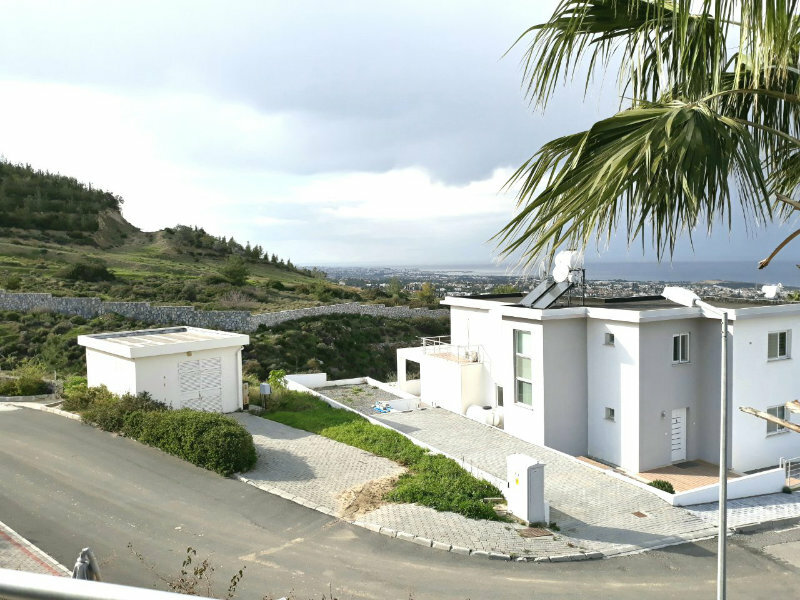 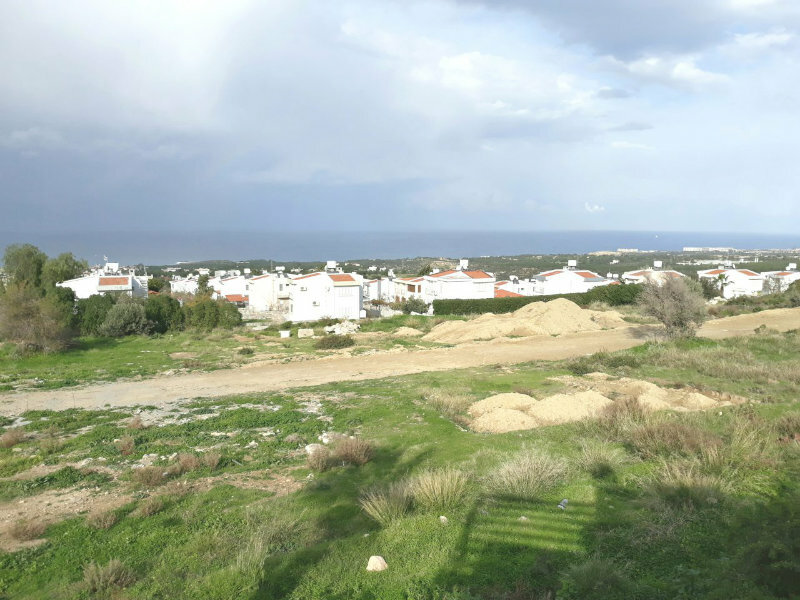 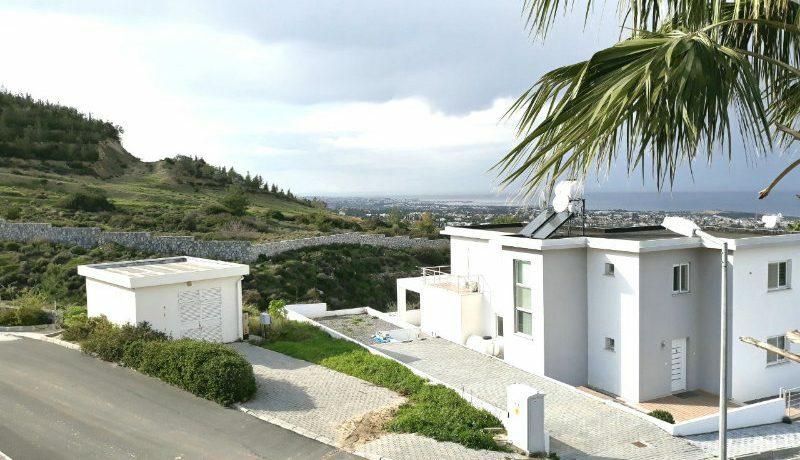 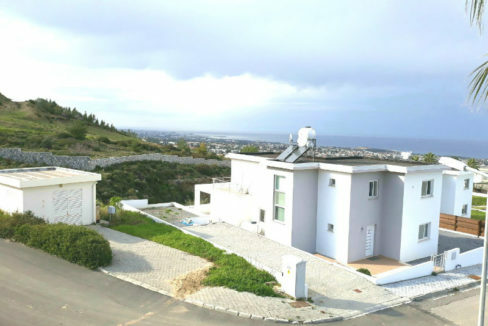 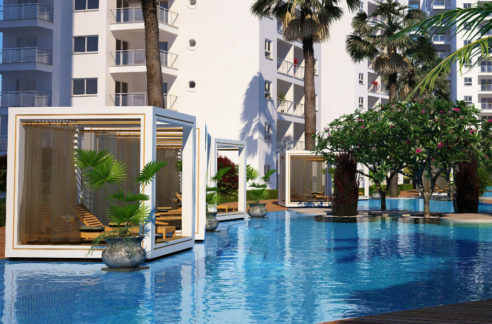 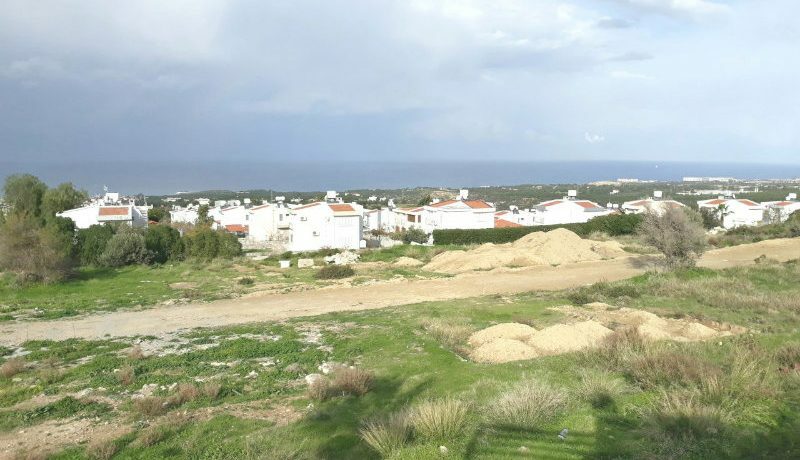 To arrange a viewing or for further information please contact North Cyprus International in the UK or Cyprus on +44 207 112 8086 or +90 548 861 0600.